Your Are Here → Home → Gadget → iGot iSight! It looks so nice mounted on top of my screen … just like nature and Feng Shui had always intended it. If you’ve got any sort of webcam, and are using AOL Instant Messenger (or iChat AV), please drop me a line so we can chat! I’m particularly interested in testing the new iChat AV Beta I downloaded. Supposedly it can video chat with PC users on AOL Instant Messenger as well. The reason we got an iSight was to stay in contact with my parents much easier, which is especially nice for when the baby comes! I just finished installing a webcam for my folks, and all tested great. The Mac/PC AIM video chat works like a charm, too! I only wish that the PC AIM client would allow you to get a bigger video screen. Who knows, maybe it’s an option I haven’t gotten to yet? 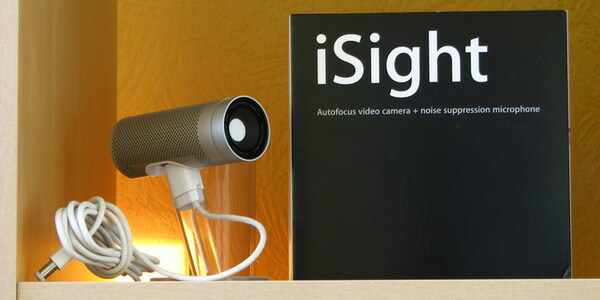 I have to say after two nights of using the iSight, I am very impressed with the product overall. Quality seems good (although two people video chatting off the same DSL connection tonight forced iChat to scale it’s quality down – should be find once I get back home on my own connection), ease of use is incredible, design is appealing … I just can’t say enough good stuff about it. Online video conferencing has come a long way! Yesterday we visited with both of my grandmas. We had bought Reunion to do genealogy stuff a little while ago, and finally got around to heading down there to visit with them. We still have the family Bible to go through and pull out names, but we’re now up over 100 people in our tree. We also scanned a lot of old photographs to put with all the research. Neat stuff. The Price is 100 Gold, or One Small Duck. Does it make sense to add an addddddd? © 2019 VenenuX. All rights reserved.